It isn’t often you have an opportunity to be part of an important technological revolution. But now’s your chance, because the new 260 AC Limited from Hallett is truly that groundbreaking. 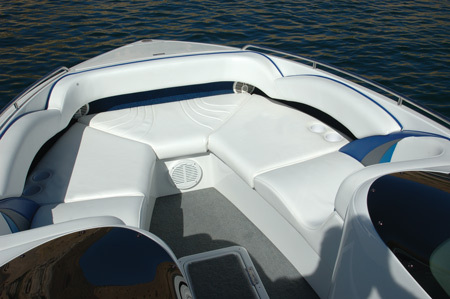 Until the present, performance-minded family boaters faced a basic hull design dilemma; vee-bottom or air-entrapment tunnel. Which one would best suit their needs? Both have their strengths as well as inherent deficiencies when it comes to blending performance, comfort and functionality for a multi-purpose family sport boat.. With that fact in mind, Hallett collaborated with renowned marine designer and industry visionary Art Carlson to create a faster, more stable breed of performance family boat. A unique hull configuration that could fully utilize today’s modern and more powerful engine propulsion packages to their maximum potential. 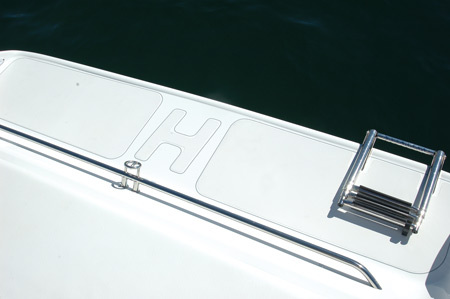 The result of years of development and refinement is the all new Hallett 260 AC Limited with a patented hull bottom featuring a synergy of twin air-slot aft outriggers enhancing proven vee-hull technology. Gone is the high speed wobble. Gone is the bow-high struggle to get on plane with load. Gone is lackluster turning response. Instead, enjoy a new level of all-speed stability, exhilarating performance, lighting quick acceleration, superb handling, nimble cornering, a feather smooth ride, plus an unmatched feeling of confidence and security when you’re behind the wheel. 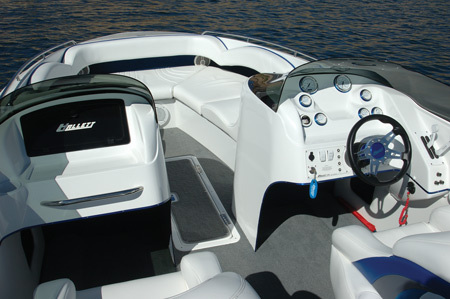 So special is its abilities, the 260 AC Limited is even primed for water ski and wakeboard duties. Until now, family performance boating was a compromise… it’s not any more. You won’t find many true walk-thru bowriders in a 26-footer, but Hallett has the best. It’s the perfect lay-out for that wakeboarding family. No skimpy bowrider here. It’s just one big playpen with exceptional upholstery and a generous sized in-floor ski locker. If you were wondering what a real full-sized swim platform looks like, this is it. And don’t forget, the telescoping stern ladder is a standard feature. Different? You bet it is. 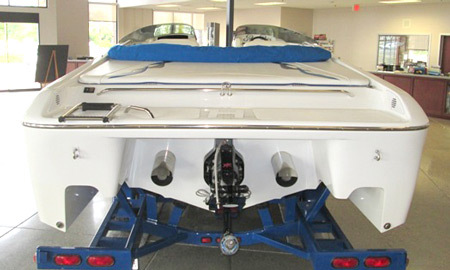 This is a patented twin air-slot vee-bottom developed by designer/boat builder Art Carlson. Virtually no bow rise when getting on plane. More lateral stability than a conventional vee-bottom. And it feels like it turns on rails.